I was driving to our Saturday afternoon dress rehearsal at the RNCM when I was overtaken at high speed by an ambulance and a police car, both with lights flashing and horns blaring. Ah, I thought, a blessed pair of sirens. Must be a good omen! And it was. I enjoyed the rehearsal. Singing now to the accompaniment of the organ, and with the 10-strong brass ensemble supporting us in the second half, the music really came to life. We had been rather short of rehearsal time and I know many of us found the music exciting but demanding. Trying to practise with a CD of an actual performance was difficult – no conductor on view to give us the beat and the entries. But the practice CD was terrific, with its helpful metronome and clear statement of all the parts. I played it constantly in the car. And so to the evening performance; the big event. Processing onto the stage with the other 90 or so members of the choir (remembering to hold our music on the audience-facing side! ), we were pleasantly surprised to see a fairly large audience. We sit and wait. A few stragglers join the audience. Then silence – always too long! The concert begins. David, our deputy conductor, takes us through a rousing rendition of the Parry. Steven, our musical director, follows with vigorous performances of the two Elgar anthems, not all that easy to sing, but inspiring stuff. And between the anthems, an Elgar piece played with a terrific mix of grace and gusto by our guest organist, Jonathan Scott. A successful first half. We’re pleased – and possibly a little relieved! As ever, the much larger audience at the adjacent opera theatre in the RNCM breaks at the same time – crowds of thirsty concertgoers everywhere. I find time to point out to James Eastham, distinguished conductor of Salford Choral, that he should be listening to us not the RNCM opera chorus. 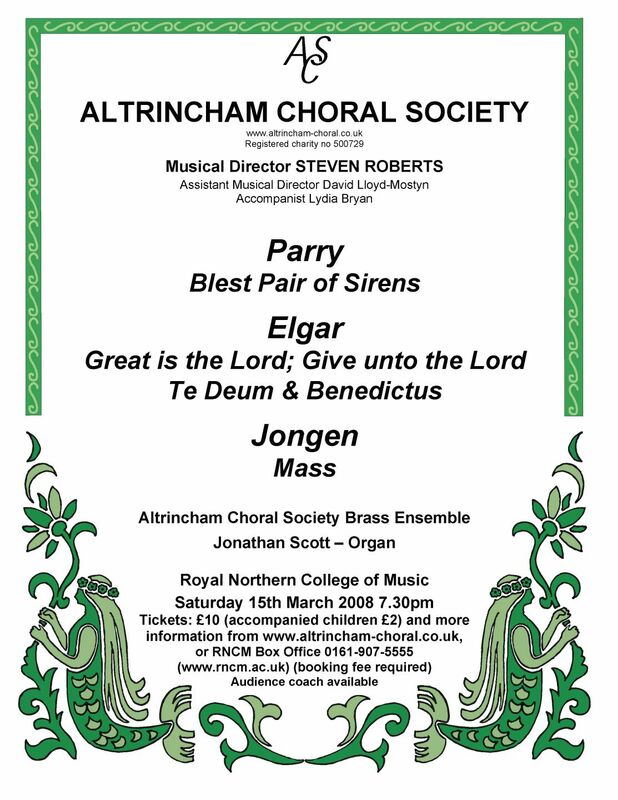 Second half – the Mass by Jongen. Who’s ever heard of Jongen? No-one – but it doesn’t matter; the music is magnificent, the brass and the organ support us wonderfully, and we get (almost) all the entries right. All the hard work – and Steven’s energetic admonitions – have paid off. I think we did it justice – and everyone I spoke to in the audience thought so too. Not just a good concert – a great one! And it’s back to the RNCM for Showstoppers in the summer. Songs from stage and screen. What will they think of next?